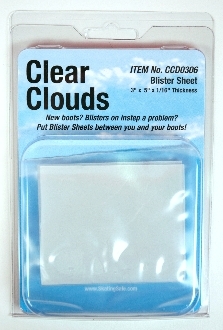 The Clear Clouds Blister Sheet is specially designed for skaters who have new boots and/or spending long hours on the ice. Alleviates discomfort caused by your boots and offers superior blister and abrasion protection. Constructed from a medical grade gel. They may be worn directly on the skin and will not cause skin discoloration or irritation. You can cut them to any size or shape. Sheet size is 3" X 5" in X 1/16"